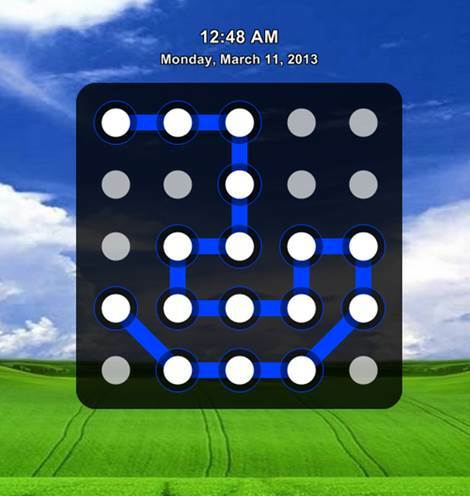 After successfully installing the Eusing Maze Lock software (809.33-KB capacity), you should restart the device. If there’s a requirement to enter the code, (there’s 9 point on the default pattern), you can use the default code which is a diagonal line connecting 1 - 2 - 3 - 5 - 7 - 8 - 9 points (in turn from left to right, from top to bottom). Get into the desktop screen, right-click on the Eusing Maze Lock program logo at the right corner of the screen, and choose Configure to perform the advanced settings, including changing login code. First, Eusing Maze Lock prompts you to declare the current code, you use the mouse to drag and connect the points as default. If the just-done manipulation is correct, the connected line will be kept intact, otherwise, you have to re-enter it. 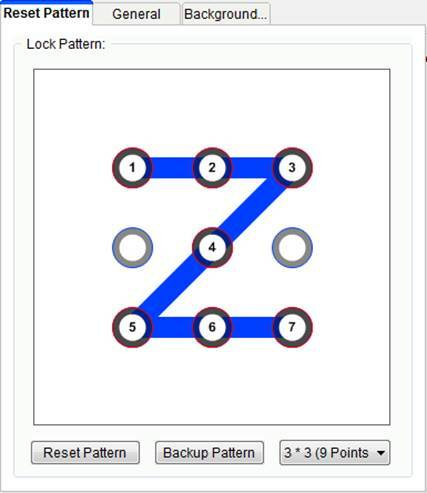 Eusing Maze Lock allows creating login password in the pattern consisting of 9 points, 16 points or 25 points, collative with the square pattern that has 3x3, 4x4 or 5x5 points. Of course, the more points the pattern is, the higher the security capability will be to the code-detecting manipulation from the bad guys. After finished choosing, click Reset pattern > hold the left mouse to drag a line connecting the points together to create a new code. When releasing the mouse, choose Yes so that the notification will pop up. Continue to choose Yes to save the image of the code which was just created into USB, memory card in case you forget the code, or choose No to pass the code-saving. Therefore, you’ve finished setting up the new code, as well as been able to use the main feature of the program. 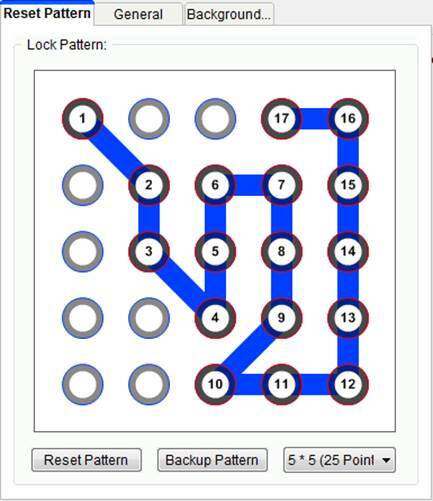 However, users need to perform some other settings so Eusing Maze Lock can work more efficiently, in General tab. 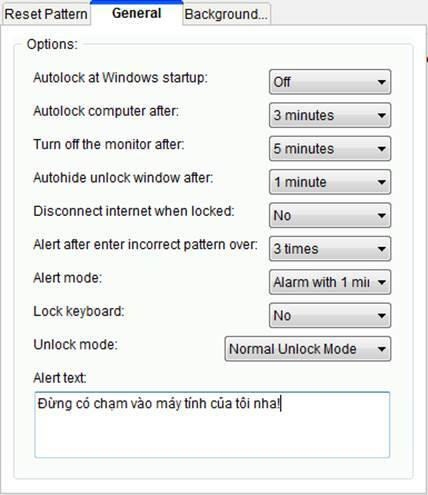 "Autolock at Windows startup" options will let "Eusing Maze Lock" boot with Windows and lock the device immediately after logging in the Windows user account. "Turn off the monitor after" option will enable the auto screen-turning off mode after a while. "Autohide unlock windows after" is a mode automatically hiding the unlocking pattern after a period of time with no operations. If you want to disconnect Internet when the laptop is locked by "Eusing Maze Lock" choose Yes before "Disconnect Internet when locked". "Alert after enter incorrect pattern over" lets the device send the alerts after entering the code incorrectly for a while, and to enable alert mode, choose "Alert mode". Notification appears when someone intentionally opens the lock code. Besides, you can change the notification configuration when the device is locked by Eusing Maze Lock, at Alert text. Lock keyboard feature helps users lock the keyboard and Unlock mode to open the device. 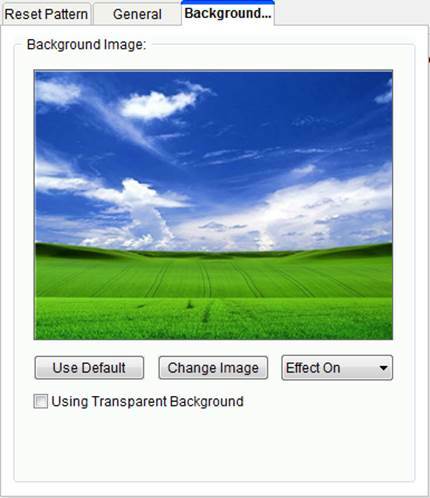 Finally, turn to the Background tab to change background at lock mode. Doing such, you can use the default screen of the program (Use Default); or use the current desktop screen, but hide all other objects on desktop screen (Using Transparent Background). 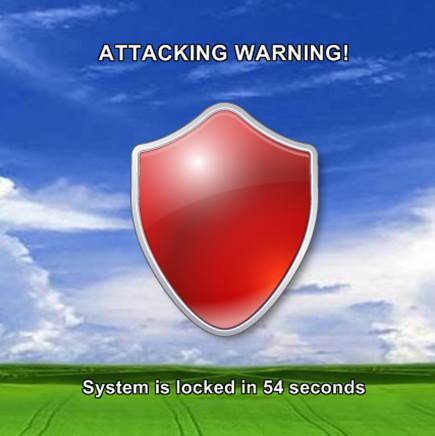 And if you want to use any images, press Change Image, choose the needed one, press OK.
Also having the identical interface, feature and set-up way like Eusing Maze Lock utility, however, XUS PC Lock also supports some private settings in Advanced bar (XUS PC Lock Fix Tools set up together, respectively). 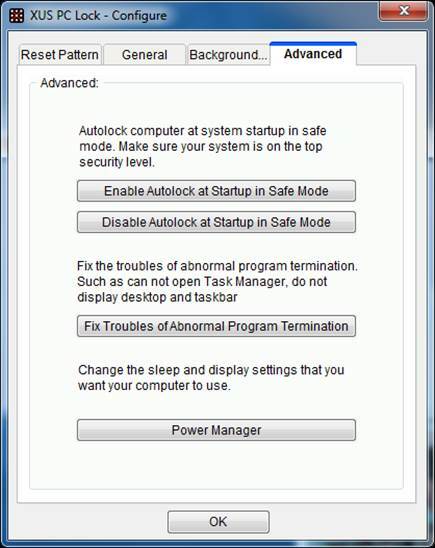 First, it’s a feature that does/doesn’t allow XUS PC Lock to work even in Safe Mode (Enable Autolock at Startup in Safe Mode/ Disable Autolock at Startup in Safe Mode). Besides, there’re some case users can’t access Task Manger, view the desktop screen or taskbar doesn’t pop up. To solve these errors, you only have to click on Fix Troubles of Abnormal Program Termination.